The Turkish Angora cat is considered to be a semi-long haired cat. The coat is long but not as thick as that of Persians. It is single-coated, which means there is only one layer of hair. This also makes the coat easier to maintain as it doesn’t mat so easily. Actually the Angora is an easy-maintenance cat when it comes to coat grooming. Brushing / combing once or twice a week with a fine-toothed comb or slicker brush is enough. During summer the Turkish Angora cat sheds more hair, so brushing more often will ease the hair-load on your furniture. Because of this summertime shedding, the cat’s hair looks a lot longer during winters. The hair is longest around Angora’s neck (the ruff), on its tail and hind legs. The coat is fine, silky and has a special shimmer to it. It is of medium length and tends to be wavy and longer on the underside and the ruff. The hind legs have britches. The coat should lie smooth but be so loose that when the cat moves, the coat movements accentuate the muscle movements underneath it. The Turkish Angora cat won’t develop a full coat until it is at least two years of age (and before that the white cat may show some color spots) – sometimes it can take as long as five years. Good things come slowly! This is a rather slim and small cat. The weight is about 10 pounds / 4,5 kg only. A female angora cat can be as tiny as 6 pounds / 2,7 kg, so they really are pretty small. And yes, pretty. The male Turkish Angora cat is a bit bigger. The Angora is a real ballerina of a cat. 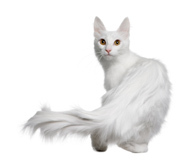 When you see a Turkish Angora cat moving, it is such a beautiful sight: it is balanced and graceful and literally glides through the space with is gorgeous plume of a tail floating lightly. Its body is of medium size and long – you could say it is enlongated, slender but firm. The shoulders and hips are of the same width, and its chest is slim. The rump is slightly higher than the shoulders. Its legs are long, elegant, with tiny paws and long tufts of hair between the toes. The Turkish Angora is a finely boned cat. The tail of the Angora is a most eye-catching feature. It is long, tapering, wide at the base, narrow at the end and has a full brush. Beatiful! Normally it is carried lower than the body in an upwards curve, but this does not mean it trails. Often the Angora carries it in a proud plume over the body when it moves, and oh what a sight that is! 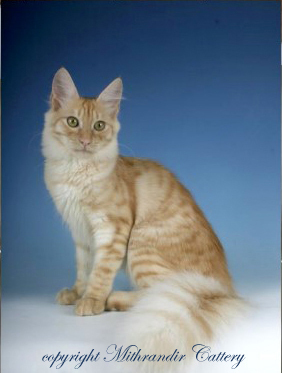 The neck of a Turkish Angora cat is elegant, slim and of medium length. The head is small to medium in proportion to the body, very pretty, wedge-shaped and the face is delicately boned. There is no pronounced whisker pad nor pinch. The nose is of medium length and the chin is cently rounded (the males have a bit more rounded face). The overall effect is triangular, very delicate and pretty. The eyes are large, almond shaped and slightly upwards-slanted. The expression is open. The eyes can be of different colors: green, green-gold, copper, blue. The special feature that has been greatly appreciated through the history are the cats that are odd-eyed: eyes are of different color. But whatever the color, it should be deep – and in odd-eyed cats both eyes should have the same intensity of color. Different colored Angoras can have eyes of any colors, but the Silver Tabbt Angora should have green eyes. As with any other cat breed, the gene that causes the white coat and blue eyes may also cause the white coated and blue eyed Angora cat to be deaf. Chances are that if the cat is odd-eyed, and the other eye is blue, then the cat can be deaf in the ear above the blue eye. It has been noticed that when white Angoras are bred with other colors, this results in less deaf kittens. 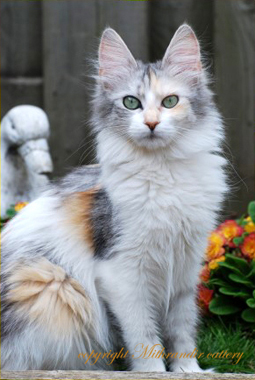 You can read more about the Turkish Angora's colors here. If you are interested in providing a home for a rescued Turkish Angora, check out the Turkish Angora rescues here. Photograph copyright holder of the white Turkish Angora cat looking over its shoulder is by GlobalP / IstockPhoto.